Isn’t This What We’re Supposed To Do? An inspiring account of faith in action from a local pastor here in Hendersonville, NC. This humble woman in Kenya has a lot to teach us all about being doers of the Word and not hearers only and allowing the light of the Gospel in our lives to draw others to Christ. Fall has arrived in all its splendor here in the mountains of western North Carolina. Visitors are flooding into our sleepy little communities and navigating our winding roads to bask in the wonder of God’s creation and to capture that perfect photo for posting on social media. Not being much of a photographer myself, I’m usually disappointed with my own photos. They rarely adequately convey the breathtaking beauty of the Creator’s artistry. One trick that works well for capturing the vivid colors of autumn is positioning the camera so that the sunlight forms a backdrop for the shot. 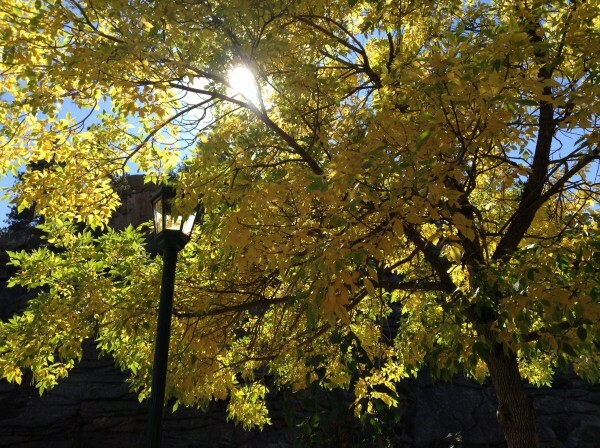 This technique greatly enhances the natural colors, as the light filters through the leaves and creates the appearance of a “tree with the lights in it”, as perfectly articulated by Annie Dillard in her Pulitzer Prize-winning work, Pilgrim at Tinker Creek. This photo I took of a copse of aspens in Estes Park, Colorado a couple of years ago serves as an example. It grieves my heart, as I’m sure it grieves God, when I hear of seekers who have been turned away from the Christian faith by the actions of those believers who all too often serve as a barrier to God rather than a conduit. It grieves me even more when I stop to consider how often I have likely been that barrier myself. Paul tells us in Galatians that our flesh constantly struggles against God’s Spirit for control of our hearts. When the flesh temporarily wins that battle, the light of the Gospel dims and we begin to blend into the woodwork of humanity. But when we surrender to the leading of his Spirit, God’s glory sets us apart from the crowd and draws others to the Christ who resides in our hearts, just as the autumn splendor of God’s creation is drawing so many visitors to these mountains arrayed in their annual October palette of colors and light, perfectly blended. Never forget that people are always watching. They may not know a word of Scripture – they may not even own a Bible. But we are surrounded by people looking for light in an often dark and gloomy world. May they see that light in us that we might be the conduit Christ uses to draw them to himself. I love sunsets. Any of you who follow me on Facebook probably know that by now, given the number of sunset photos I have posted through the years. 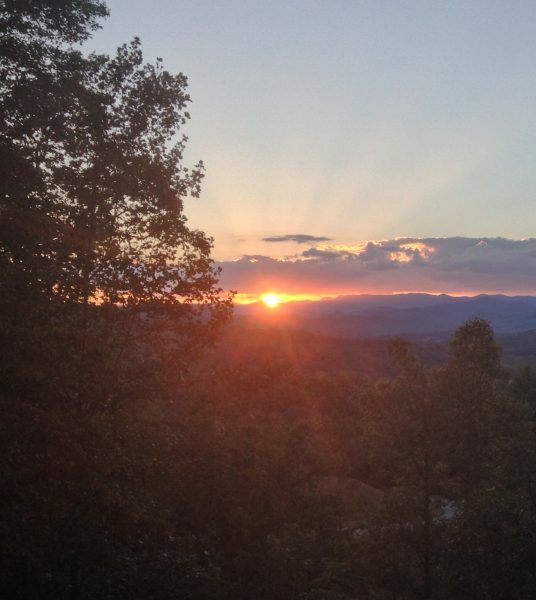 From the comfort of my deck I have a front row seat to the sun setting each night over the Blue Ridge Mountains to the west of my home in Western North Carolina. That view inspired the name for this blog, Ridgetop Reflections. It amazes me just how unique each sunset appears. Quite often they take my breath away and sometimes even leave me in tears. They never fail to remind me of the closeness of God’s presence. And I don’t believe it is a coincidence that the most awe-inspiring sunsets seem to appear when I most need to be reminded just how close God actually is. Such was the case recently when this one capped off a particularly difficult week. When you face the inevitable trials and heartaches of this life, take time to reflect on those promises from God’s Word. Remember that the God who created us and who made his dwelling among us in the person of Christ now lives within us in the person of the Holy Spirit. Even in our darkest days, when sometimes he seems so distant, God is closer than we realize. If you don’t currently have a sanctuary where you are able to just be still and sense his presence, I encourage you to find one and return to it often. As for me, I can’t wait to see the sunset he paints for me tonight!